If you’re looking for some chart patterns on the Kiwi, then I’ve got your fix ‘coz I’m serving up a channel on NZD/USD and a triangle on AUD/NZD in today intraday charts update. The Kiwi has been trading with a downward tilt lately. And if connect the most recent peaks and troughs, we can see that the pair has been moving lower while inside that there descending channel. And as I always say, one of the more conservative ways to play a descending channel is to look for opportunities to go short when the pair is at or close to the channel’s resistance area. Well, as luck would have it, the pair is currently testing the channel’s resistance area. 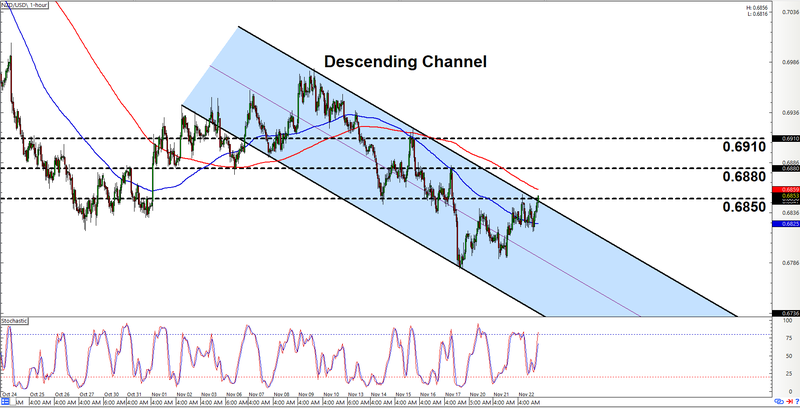 And the channel’s resistance area happens to line up with the area of interest at 0.6850. Y’all therefore better start looking for an opportunity to go short on the pair. And all the more so, given that stochastic is already indicating overbought conditions and all that. As always, however, the risk for an upside channel breakout is always so there. So, just know that a break higher past 0.6880 is an early sign that bulls are in control. And if the pair moves even higher and takes out 0.6910, then y’all may wanna bail yo shorts, if you still have ’em. You may even wanna switch to a bullish bias at that point. AUD/NZD has been trading sideways for a while now. 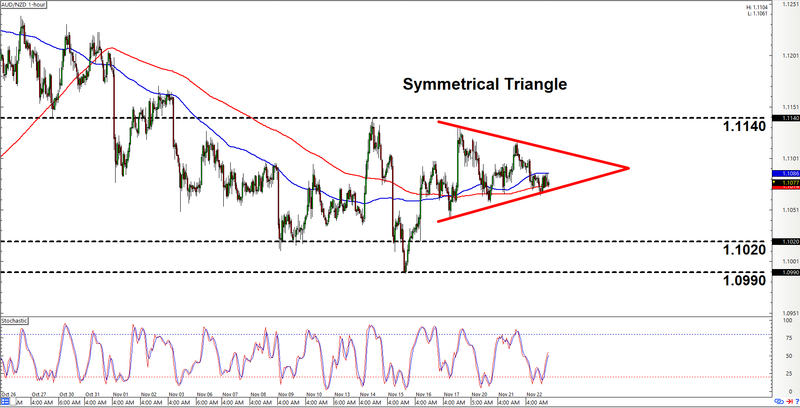 And recently, the pair’s price action began tapering into a point, so much so that a fresh symmetrical triangle appears to have formed. As y’all should know by now, a symmetrical triangle could break either to the topside or the downside. And y’all may wanna prepare for both scenarios. Just note that an upside breakout needs to clear 1.1140. A downside breakout, meanwhile, has to break lower past both 1.1020. Although there’s also an area of interest nearby at 1.0990, so y’all may wanna wait until the pair clears that as well before chillaxing. In any case, just make sure to always practice proper risk management, a’ight?